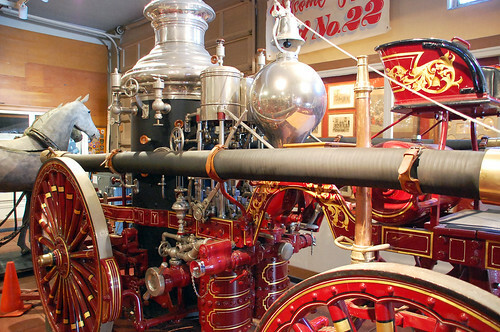 This afternoon I paid a quick visit to the San Francisco Fire Department Museum, where I was instantly drawn toward Engine 22 -- an amazing steam-powered engine built by American LaFrance in 1893. 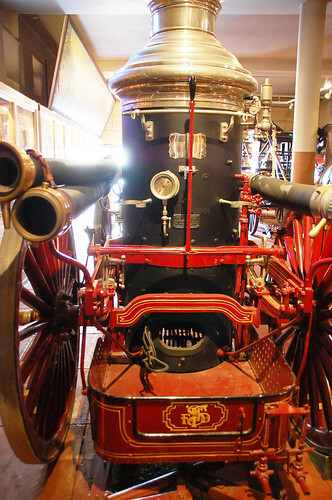 By 1922 the Department had completed the conversion from horse drawn apparatus to motorized units. This engine was sold at public auction to the Simpson family of Hood, California, who planned to use it to pump water from the Sacramento River into their vast pear orchards. Before the engine was placed into farm operation, the family realized the value of the engine as an antique. 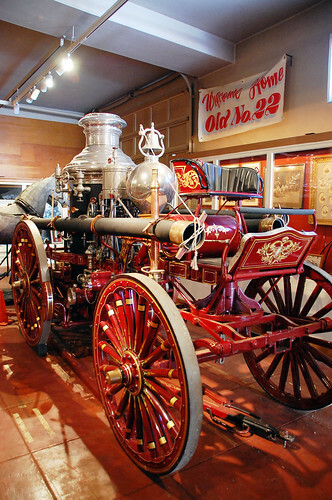 They stored the engine in their barn until the early 1970’s when Michael Simpson entered into a loan and restoration agreement with the museum at the San Francisco US Mint at 5th and Mission Streets. During the next four years the engine was restored to its original pristine condition, with the exception of rebuilding the boiler. The gold leafing and surrounding paint embellishments were completed by a retired gold leaf expert from the City and County Central Fire Shops, who had worked on steam engines as an apprentice.